Smaaash is best known for being a gaming arena and now they’re upping their ‘game’ with Cyberhub’s first ‘booze exchange’ where you can enjoy the thrill of trading and score the best price for a round of drinks. What’s even better is that the ambiance is super laid back and uber chic! Ever saw traders go ballistic trading stocks, spinning money and making a big buck off the whole show? Now you can do the same at Smaaash, Cyberhub except with booze! Walk into what looks like a real stock exchange, complete with proprietary software, trading servers, LCD screens, LED tickers and even a stock market, all of which makes the entire experience very believable and that’s when you realize you’re trading for the best price for your next round of drinks. The idea is to bet on drinks and if you get it right then that’s the price you pay. 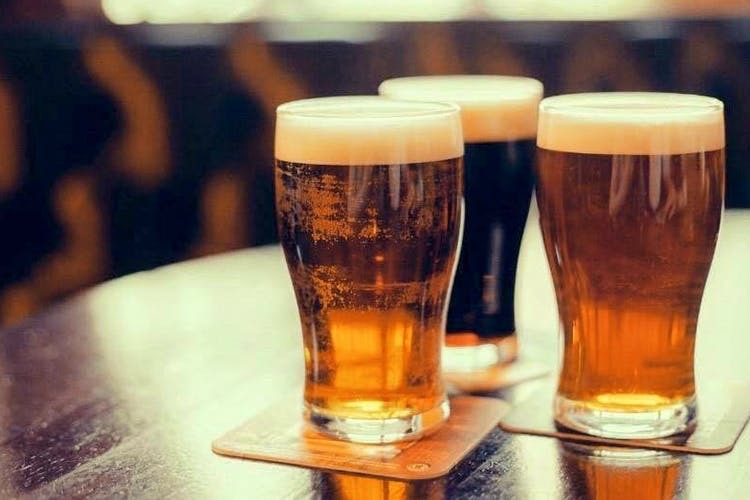 The concept is that the prices keep fluctuating based on the demand of the drink and are displayed on screens around the bar with a special software technology to monitor this demand supply algorithm. You end up creating great prices for your favourite sprits! What’s more? You can also place an order via a specially developed GPE app that lets you monitor prices and order in real time. It’s more fun when you’re in a group because you can compete with each other and the system to score the best prices on the tipples you wish to have that day. So go ahead and trade via the app or live at the bar itself. The food menu remains consistent with loads of bar bites and since you’ll save a load of money on your bar tab, dig into Indian, Asian and Continental starters and mains. You could go in for burgers, sandwiches and wraps but we were sold on the tikkas and kebabs! Here’s where it gets super funky every day. Wait on the market to crash so you can trade your favourite tipple at rock bottom prices! Now get set to start gaming at a whole new level!